When you choose us as your roofing contractors, you will find that we set ourselves apart from the competition in Newmarket. One Job at a Time – If you have talked to other roofing contractors who have said that they have multiple jobs going on at the same time, you may find it refreshing to hear that we never take that approach at Slippery Slope Roofing. We give our customers special attention by only working on one job at a time. Timely Work – We also know that when you need a roofing contractor, you can’t always afford to wait while they focus on another job. Because we only do one job at a time, your roofing project will have our full attention, so we can complete the work in a timely manner. 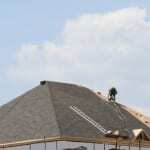 Quality Roofing – At Slippery Slope Roofing, our team has over fifty years of combined experience providing roofing services for homes and businesses. We are committed to doing the job right the first time, and that is service you can rely on. If you are looking for roofing contractors in Newmarket, Ontario, look no further than Slippery Slope Roofing for your roofing project. We know you will see the difference when you work with us. Call today to schedule an estimate or to learn more about how we can assist you with quality roofing services.